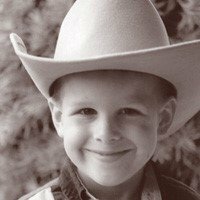 Brandon was diagnosed with a metastatic medullablastoma brain tumor on June 26, 2002. He was 4 ½ years old. He became a big brother just three weeks before to his little sister, Katie. Brandon was having symptoms from the brain tumor and everyone thought it was due to the new baby. We knew something was wrong, but had no idea what. As bad as it was, we were fortunate to find it when we did. Brandon had an eight hour surgery to remove the brain tumor; he had four chemotherapy treatments and six weeks of radiation, twice a day. Brandon was in remission for about 6 months and he relapsed in September of 2003. Brandon had his ups and downs with remissions and relapses. He had a total of 5 high dose chemotherapies with stem cell rescue. Unfortunately, Brandon lost his courageous battle with cancer on April 13, 2007 at 9 ½ years old.